The ECTE Manual – 6th Edition, 2018 is organized in six main parts. The first defines the Identity and the Mission of the ECTE which, in addition to its historic distinctiveness as an accreditation association, is evolving in its self-understanding as a network of European theological institutions. The second part is dedicated to Membership, and describes the standards and procedures for membership in the ECTE. The third part contains vital information about ECTE Accreditation, from procedures, stages and standards and guidelines in preparing a Self Evaluation Report. The fourth part groups together several important Appendices, the fifth part contains several Forms that will be needed in different stages and the last part contains Visitation Guidelines. 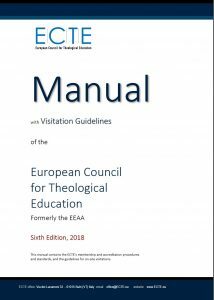 Schools interested in ECTE accreditation will make use of the entire manual, while schools interested only in becoming part of the ECTE network will need to consult the first and second chapters and selected appendices. The 2018, 6th edition of the ECTE Manual does not contain any substantial modifications on standards or procedures from the 2012, 5th Edition, but important additions and improvements have been made. Items of updated or innovated ECTE policy will be uploaded here.